Samsung Electronics has upgraded its large-screen smartphone, the Galaxy Grand, with a quad-core processor and an even bigger, HD screen. The Galaxy Grand 2 has a number of hardware improvements over the first Grand, which was announced last December. The Grand 2's processor has four cores, twice as many as its predecessor's, but runs at the same speed, 1.2GHz. Its screen measures 5.25 inches across the diagonal and can display HD video with a resolution of 1280 by 720 pixels, an improvement on its predecessor's 5-inch, 800-by-400-pixel screen. 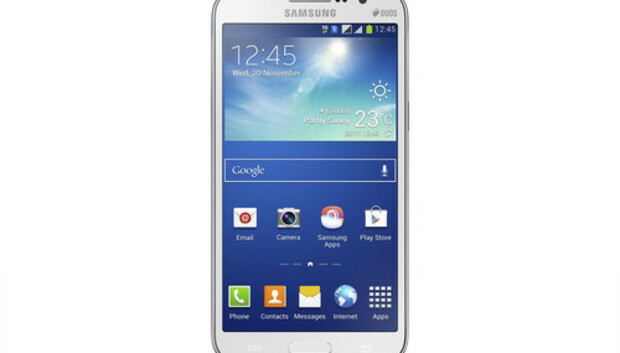 To power those performance improvements, Samsung has increased the battery capacity from 2,100 mAh to 2,600 mAh. The bigger battery and screen has had little effect on the size and weight of the Grand 2 compared to its predecessor. It is one gram heavier and a couple of millimeters longer and wider. The thickness is virtually the same at 8.9 millimeters versus 9.5 millimeters, according to Samsung's spec sheets. The Grand 2 has the same resolution and basic processor configuration as the recently announced Moto G from Google-owned Motorola Mobility, which set a new performance benchmark for devices costing around US$180 without a contract. Like its predecessor, the Grand 2 has an 8-megapixel camera, while the Moto G only has a 5-megapixel camera. Neither device supports LTE. For storage, Samsung has stuck with 8GB of integrated storage and a microSD card slot, while the Motorola device is available with 8GB or 16GB of built-in storage, but no card slot. Both devices currently run Android 4.3, but while Motorola has said it will upgrade the Moto G to version 4.4 in January Samsung is mum on its upgrade plans. Unfortunately Samsung also isn't saying what the Grand 2 will cost, so for now its hard to say which is the better value.